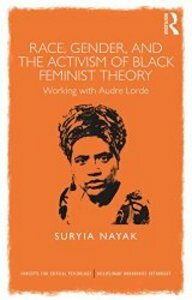 Nayak, S 2014, Race, gender and the activism of Black feminist theory : Working with Audre Lorde , Other, Routledge, London and New york. Beginning from the premise that all ideologies and movements for radical social change including critical psychology needs to be questioned, dismantled, and new perspectives brought to the table in order to produce alternative solutions, this book takes an unusual trans-disciplinary step into the activism of Black feminist theory. The author, Suriya Nayak, presents a close reading of Audre Lorde and other related Black feminist scholars to demonstrate how the activism of Black feminist theory is concerned with issues that are central to radical critical thinking and practice, such as identity, alienation, trauma, loss, the position and constitution of individuals within relationships, the family, community and society. Nayak reveals how the activism of Black feminist theory seeks to address issues which are also a core concern of critical thinking and practice such as critical psychology, including individualism, essentialism and normalization. Her work grapples with several issues at the heart of key contemporary debates concerning methodology, identity, difference, race, gender, social change, and the psychological impact of social constructions. Using a powerful line of argument, the book weaves these themes together to show how the activism of Black feminist theory in general and the work of Audre Lorde in particular can be applied to the subject and practice of creating social change in the face of the psychological impact of oppressive social constructions. Race, Gender, and the Activism of Black Feminist Theory will be of great interest to advanced students, researchers, political activist and practitioners in psychology, counselling, psychotherapy, mental health, social work and community development.